The Good Counsel boys team entered the season with lofty expectations, aiming to win the WCAC title, win the MD-DC Private Schools state title, and travel to the NXN Southeast Regional Meet in hopes of qualifying for nationals. It has been a bumpy season, but Good Counsel can cross at least two items off that list. The Agricultural Farm Park 5k XC course was much drier than it was when the IAC/MAC/ISL Championship was hosted there in rain and sleet two weeks earlier, but the course was reported to be pretty torn up and therefore difficult to run on. In the varsity boys race, a pack of seven guys formed a lead with a gap on the field in the first mile. Gonzaga's Mike Crozier reportedly put in a surge at the midway point in the race, leaving the others to fight for second place. Emerging from that chase pack was Georgetown Prep's Joey Chapin who was undoubtedly making up ground on Crozier in the final 1000 meters. Crozier reportedly felt the pressure from Chapin and did what he needed to do to keep Chapin off him, but was fortunate the race was not much longer. Crozier finished six seconds ahead of Chapin to win in 15:58. Good Counsel's Jack Riely faded to sixth place down the stretch and in the words of Coach Tom Arnold was "puking his guts out," for a while after the race. Despite the off-performance, Riely led Good Counsel to a narrow 12 point win over Loyola-Blakefield. Collin Crilly had a typically strong race, finishing just behind Riely in 7th. Allen Meringolo, who missed the first half of the season with an injury, continued to look good in his comeback with a tenth place finish. Arnold also acknowledged 14th place Jimmy Kazunas for his late season surge. "We had a few guys run well and a few guys not as well," explained Arnold. "We were fortunate to squeak out the win over Loyola." 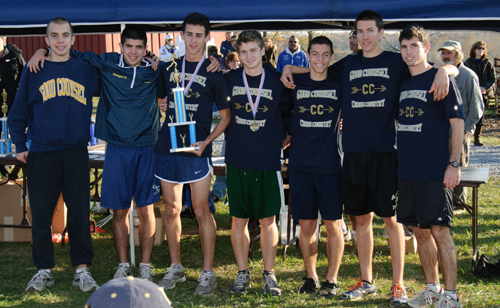 It was the first time the Good Counsel boys won the championship since the meet converted to its present DC-MD format in 2002. The Heights' Gregory Hadley was the first runner in the small schools division to cross the finish line in 16:42. A much more dispersed race within the race, there were less packs of runners for Hadley to be wary of. St. Andrew's EJ Douglass was second with a time of 17:11 and Hadley's younger brother Alex was third in 17:47. As predicted, The Height's walked away with the victory and a mere 36 points. The surprise of the day was St. Andrew's repeat as runners-up. They have struggled throughout their season and some doubted if they would have been able to pull it together for the state meet. They edged out Annapolis Area Christian for second place, 61 points to 63. On the girls' side, the race was something to behold. Catholic High School of Baltimore's Ellie Gonzales started in the front and stayed there. She finished her run in a blistering 18:15. Her race was reminiscent of John Carroll's Elizabeth Tauber who won three consecutive state championships at this course. Gonzales first came into the spotlight when she won the varsity race in the IAAM "C" conference last year as a freshman. Finishing one minute and thirty-four seconds later was Georgetown Visitation's Grace Carr in 19:49. Carr helped Visitation reach third place in the large schools' division with 76 points. With only a two point lead over Visitation was National Cathedral School with 74 points. And Archbishop Spalding was victorious with 55 points. In the small schools' division, homeschooled freshman Meghan Lockett won in a time of 19:16. Over a minute later, in a respectable 20:31, was Hedda Boege from Washington Waldorf. As far as team scores go, it was an extremely close race for second, with St. Andrew's coming in ahead of Bishop Walsh by only a single point (81-80). Victorious was Annapolis Area Christian, with a low score of 38.